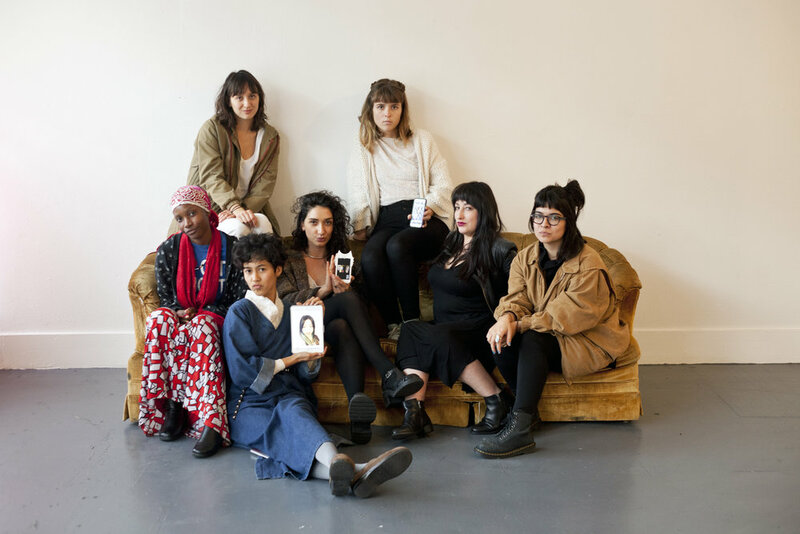 In February 2016 IUD: A Place You Think About presented a series of programmed exhibitions featuring emerging female artists. View from outside Helmuth Gallery of Famo Musa's work. Rebecca Maria Goldschmidt's sculpture cleanses photos through fire. December 2015 Date Night Art Fair hosted the first iteration of IUD Gallery: a place you think about . On December 12 & 13th 2015 Maria curated a series of intimate performances in a small space behind a sheer curtain. The following is a list of the performers: Salomeya Sobko, Kim Schreiber, Marco Antonio Huerta, Maria Rios-Mathioudakis, Marcel Alcala, and Siera Hyte. Salomeya Sobko performing live music from bellow the bench. View of Marco Antonio Huerta reading his work from outside gallery curtain. View of Marco Antonio Huerta reading his work from within gallery curtain. Audience members are asked to hold a wind chime as Kim Schreiber reads from behind the curtain. Audience peaks behind gallery curtain to share in the intimacy of the performance. Disembodied performance by Marcel Alcala. Performer Siera Hyte and her daughter in IUD a place you think about performance space.